Haru gets a call later from Takatsuka (Aki’s best friend and #2 on the swim team) telling her that Aki had died in a car crash. Haru is in shock. What shocks her even more is that Takatsuka told her that Aki wanted to tell her that he loved her, which is a bit late for Haru who also loved Aki! But the story ends there for Aki and contines for Haru, Haru enters Kitakou High School and runs into Seki the resident bad boy of the school. Seki finds Haru on the steps smoking a cigarette and crying and offers her a stick of gum! One of the things I love about Waseda’s work is the sketchy, liney art. Her characters have amazing hands (four knuckles) and very expressive eyes. 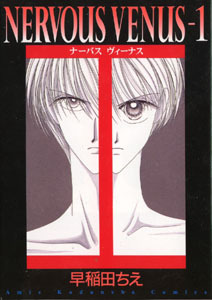 Its one of my favorite manga. The characters have more than one side to them which Waseda tries to show through flashback chapters. Unfortunately it seems as though Nervous Venus was meant to be doomed from the start. It was considered on the pillars in Kadokawa’s magazine “Amie” until Amie encountered bad ratings and Kadokawa had to pull the plug. Waseda herself was also suffering from a very bad illness so the story came to a grinding halt. One chapter ran in Amie half finished. Unlike most of the stories that ran in Amie (Telescope Diaries, Juline, etc.) that had rather abrupt endings, Nervous Venus had no ending and didn’t even run a chapter in the last Amie. What I like about the story is the multifaceted characters and their relation to each other in the story. Seki who is a near genius and handsome boy really loves Haru who does not like Seki because he reminds her of Aki. Kanda (Seki’s best friend) also is very close to Seki and seems to have feelings for him too (wooo plot twist!) Throw in Seki’s family and the story seems to have its work cut out to see who ends up with who and what happens in the end. Nervous Venus currently has 3 volumes and 2 side stories in the Amie Spring and Winter Revivals. An extra chapter is due out in a Nakayoshi Extra.